The topic of food allergies and intolerance has gained a worldwide attention in the recent years, because their prevalence has been on the rise. As medicine advances, so does our understanding of the immune system and the effects certain food substances have on the body. 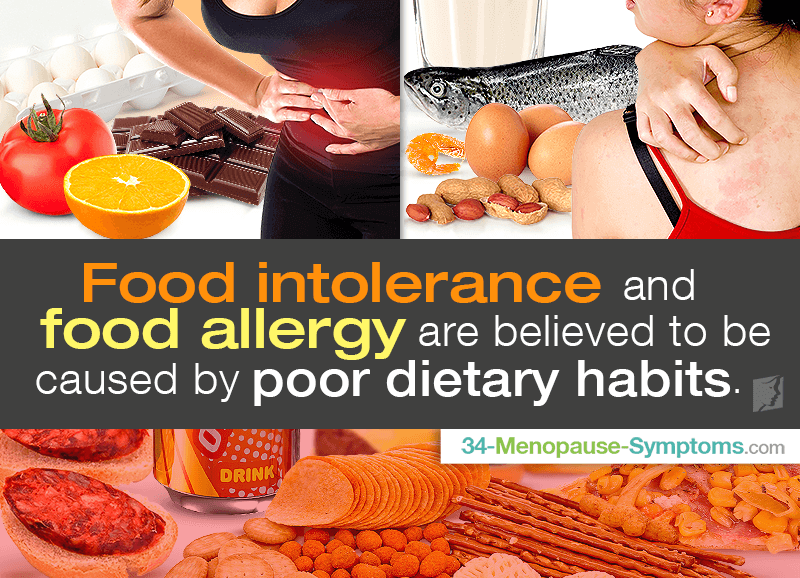 Many menopausal women use the terms food intolerance and allergy interchangeably, but the truth is they differ a great deal. Let's take a look at food intolerance and allergies to better understand them and see how they are linked. Food intolerance or sensitivity happens when the digestive system does not break down certain foods properly. There can be various underlying causes of food intolerance, such as an absence of an enzyme to digest some foods. Examples of that include lactose intolerance and conditions such as irritable bowel syndrome (IBS), or gluten-intolerance in celiac disease. Identifying the food that your body does not tolerate well might be tricky. Women are usually advised to make a diary of the food they eat throughout the day, so if they start feeling sick, they can immediately relate it something they just ate. Once identified, that food is best to be omitted, though typically eating small amounts of it can be tolerated without problems. Food allergy happens when there is an overreaction of the immune system to a protein found in certain foods or beverages. The body treats it as a toxic and harmful substance and initiates a complex cascade of reactions to get rid of it. Having a food allergy can be life-threatening, because it may lead to anaphylaxis, which is a severe whole-body allergic reaction an allergen. Often patients with diagnosed food allergy have to carry an epinephrine shot at all times and self-administer it in case of a severe allergic reaction to prevent anaphylactic shock, which can be fatal if untreated. The occurrence of food intolerance and food allergy has been increasing around the world in the recent years. The reasons for this trend are not fully understood, but they are believed to be caused by the dietary habits, such as increased consumption of processed food, and the higher amounts of preservatives, flavor enhancers, and other additives in our food. Some genetic and demographic factors are believed to play a role as well. Some studies have shown that the percentage of women who think they have food allergy is much higher than that of women whose food allergy has been actually diagnosed. Since food intolerance and allergy are two different bodily reactions, it is essential to properly diagnose them to prevent serious health complications. Be sure to check out the available allergy tests that can clear up any uncertainties and find the cause of your allergies at last. Many women find that they are suffering from more severe allergies as they hit menopause. This is because hormones become unbalanced at this life stage, and, since hormones have a huge effect upon the immune system, your body can become more susceptible to allergic reactions.